Liz is originally from Pittsburgh, Penn. and started improvising in 2012. Liz trained at DSI Comedy Theater in Chapel Hill, N.C. As a company member at DSI, she performed the Harold and was a founding member of the legendary(-ish) hip hop improv supergroup Public Frenemy. She also wrote and performed sketch comedy. challenging strangers to rap battles. I don't have a new lease on life, I rent to own. Liz loves improv because it's really fun. And because it distracts her from her crushing fear of death. Ever since taking her first improv class, Liz was hooked. She loves how improv can help take you out of your comfort zone and help you face your fears (well, most of them). Liz thinks everyone is intrinsically funny and interesting, improv just helps them let out their inner comedic gold. In her classes, she fosters a supportive yet challenging environment that is conducive to mutual discovery. Liz thinks the best part of teaching is watching students surprise themselves. 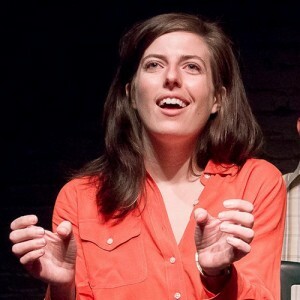 Liz has learned and performed improv in theaters in NC, DC and NYC. Currently, she performs on Madeline, a WIT Harold team, and with several other indie and seasonal projects.